Home » Extra Bytes » Weekly Recaps » Weekly Recap 10/7-10/13 plus VIDEO! In case you missed it on social media, I started a Youtube channel! After learning that I didn’t need a bunch of fancy video and sound equipment to make decent videos, I finally took the plunge and tried making my first video. It was easy, quick, and most importantly FUN! So, it’s decided, I’m going to make more videos! 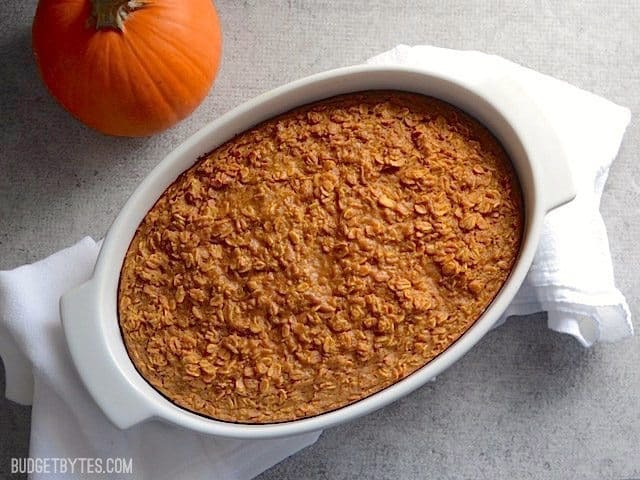 Watch my first video, showing scrumptious Baked Pumpkin Pie Oatmeal, below. Also, make sure to subscribe to the Budget Bytes Youtube Channel, so you’ll never miss a new video. I’d LOVE to hear what you want to see in video format. Leave any ideas or suggestions in the comments below (remember, if you’ve never commented before, your comments will not show up immediately). I’m planning to stick to quick recipe demos, cooking techniques, and how-to’s. After finishing the September Challenge on a high note, I decided to continue on with my $30/week grocery budget. It forces me to be disciplined, creative, mindful of waste, and to really think about my fruit and vegetable consumption. Unfortunately, this week was pretty much a bust. But hey, disasters happen and I wanted to make sure to share my fails as well as my successes because both can be equally insightful. My big two areas of fail this week were fruit and vegetables. I bought some lovely little tangerines that were a great price and a great size for single serving fruit, but after eating one and having to pick out 4-5 seeds per section, I found myself avoiding the tangerines the rest of the week. They’re still in my fridge and I’ll try to eat them this week to prevent waste, but I am not looking forward to it. I also bought a bunch of root vegetables that I planned to cover in fragrant spices (similar to the mix from my Moroccan Lentil and Vegetable Stew) and then roast to sweet perfection. Well… first I had a brain fart and picked vegetables that were almost all the same color (white), which doesn’t make for an appetizing dish. Second, they were just bitter and did not taste good. No, they didn’t just taste “not good”, they were inedible. I’m not sure if it was the vegetables themselves, the spices, or a mix of both, but I literally could not eat them (and I can usually eat just about anything). They all went in the garbage, where they smelled so bad that I eventually had to take them out to the Dumpster to avoid gagging. Extreme, right? Hard lesson learned. I’m going to have to start splitting my grocery photos into two photos… they don’t fit! Also, that’s matzo meal up there next to the eggs. It got cut off. So, I had to stock up on just a couple staples this week: eggs, garlic, onions, baking powder, and milk. The vegetables that I bought for the “disaster” roasted vegetables were fennel, turnips, carrots, and onions (which were also used for my soup). The cost of the wasted vegetables was about $4.37, or 15% of my budget. Not terrible, but not great either. I hate throwing food away! The real win for this week’s grocery trip was the sale on chicken breast. My local grocery store has this sale on a semi-regular basis, with prices less than $2/lb. (I guess they’re not too good at forecasting their sales and need to off them in a hurry?). This pack has three large breasts in it, I only used one, and froze the rest for later (quick tutorial on How to Divide and Freeze Chicken here). This amazing (and easy) Matzo Ball Soup was the focal point for my menu this week and it served me well! I gobbled it up happily every day. I estimated 5 servings, but I didn’t divide them up immediately, like I usually do, and ended up getting about six servings out of it. I found one lonely can of pumpkin purée in the back of my pantry from seasons past, so I had to make my obligatory, once per year Baked Pumpkin Pie Oatmeal. OMG I love this stuff. It makes breakfast time sooooo good and really gets me in that Autumn mood. :D And knowing that there’s going to be another pumpkin shortage this year (boooo!) made me enjoy every bite that much more. 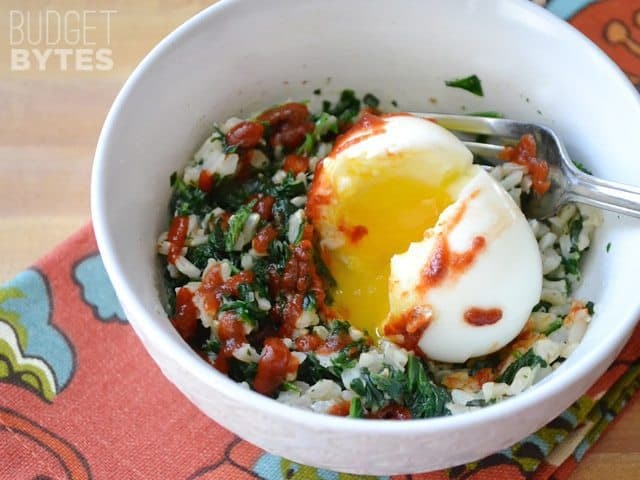 Spinach and Rice Breakfast Bowls are great any time of day, not just breakfast! These are super simple to make and because I almost always have a little frozen spinach in my freezer, it was the perfect emergency meal to take place of my flopped recipe. Woot! I also ate out twice this past week. Once for dinner on Friday and again for brunch on Sunday. Dinner was at a really fun mix and match pasta place (Arabella Casa Di Pasta) and the serving was so big that the leftovers took care of one of my meals the next day. Sunday was kind of a crazy day and brunch happened much later than expected, so it took the place of both breakfast and lunch. I was so hungry by the time we ordered that I completely gorged myself and then my stomach hurt for the rest of the day and I didn’t eat anything else. :/ Ooops. I think the reason that you’re getting your chicken so cheap is because it’s been previously frozen. At least that’s what it says on your receipt. If that’s the case, the reason it is cheaper is because you can’t refreeze it. If you are going to refreeze it, make sure you cook it first. You should not be refreezing raw chicken. As long as the chicken has been refrigerated the entire time (never gotten above 40 degrees F–the “temperature danger zone”), it’s actually safe to refreeze. There may be a slight loss in quality, but it’s safe (according to the USDA). Love , love , love your blog and now your new YT channel! 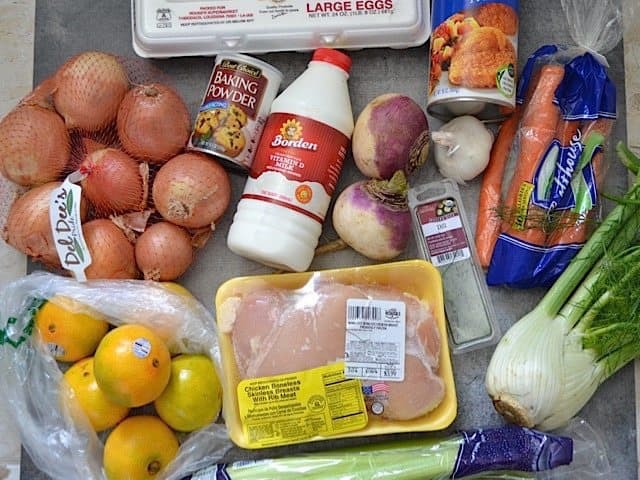 Such good information on shopping and cooking solo to stay within budget…that’s a rare find. I’m currently transitioning into new cookware and loved your article explaining how you did your research to find your current set. Videos that show you using those pieces would be great..also any brand reviews would also be helpful. I am really struggling with all the cast iron enamel and stainless steel tri-ply choices out here..but I am narrowing the field. 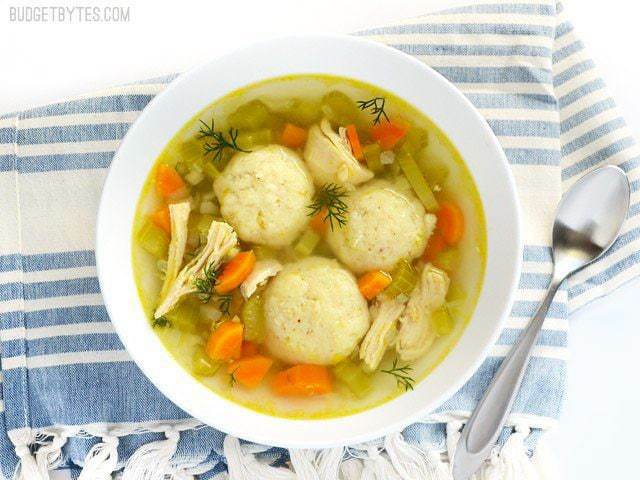 I’m actually planning to make the Matzo Ball Soup this weekend; I’ve never had matzo balls. Also, I am going to make the Spinach Rice Breakfast Bowl for my breakfasts next week to take to work. Both look so yummy! Thank you for sharing! Hi Beth, I wanted to make a request. Sometimes I have trouble recreating your recipes to satisfaction and I think it has a lot to do with ingredients chosen. It would be great if you list the brands that you use because they can alter the flavor significantly. For example, Goya canned Tomato Sauce has significantly more sugar and sodium than Hunts. Or MS.Dash Lemon Pepper has much less salt than McCormick lemon pepper. Anyway this would help me much. Wow I was just thinking last night about how I wanted to message you about starting a YouTube channel. So weird lol. SO HAPPY THAT YOU STARTED ONE- cant wait to watch all your videos!!! I know I’m going to love your YouTube channel. My only recommendation is putting text with each of your ingredients. When you add the can of pumpkin, add a text that says “14.5 oz pumpkin puree” or whatever the case is. I think linking to the receipt is great too, which I saw you did. I also love when the recipe is left in the comments.